TICKETS AVAILABLE VIA CENTRAL ARKANSAS TICKETS. CLICK HERE! Loaded guns, space heaters, and big skies. Welcome to the lethal littered landscape of Jim Heath’s imagination. True to his high evangelical calling, Jim is a Revelator, both revealing & reinterpreting the country-blues-rock roots of American music. He’s a time-traveling space-cowboy on a endless inter stellar musical tour, and we are all the richer & “psychobillier” for get ting to tag along. night away. It’s like being magically transported into a Teen Exploitation picture from the 1950′s that’s currently taking place in the future. Listening to the REVEREND HORTON HEAT is tantamount to injecting pure musical nitrous into the hotrod engine of your heart. The Reverend’s commandants are simple. From the High-Octane Spaghetti-Western Wall of Sound in “Big Sky” — to the dark driving frenetic paranoia of “400 Bucks” – to the brain-melting Western Psychedelic Garage purity of “Psychobilly Freakout” — The Rev’s music is the perfect soundtrack to the DriveIn Movie of your life. Jim Heath & Jimbo Wallace have chewed up more road than the Google Maps drivers. For twentyve Psychobilly years, they have blazed an indelible, unforgettable, and meteoric trail across the globe with their unique blend of musical virtuosity, legendary showman ship, and mythic imagery. Rev your engines and catch the sermon on the road as it’s preached by everybody’s favorite Reverend. 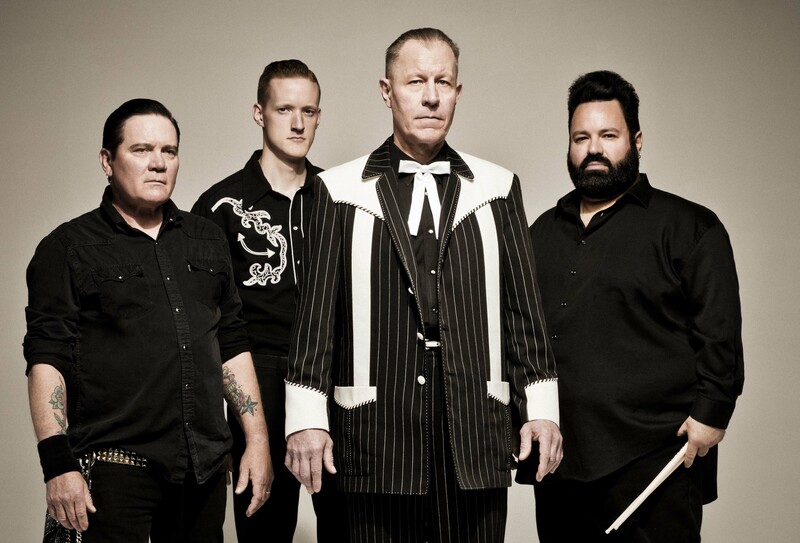 Don’t forget to keep an eye out for the 11th studio album from REV EREND HORTON HEAT, boldly titled Rev, due out January 21st.